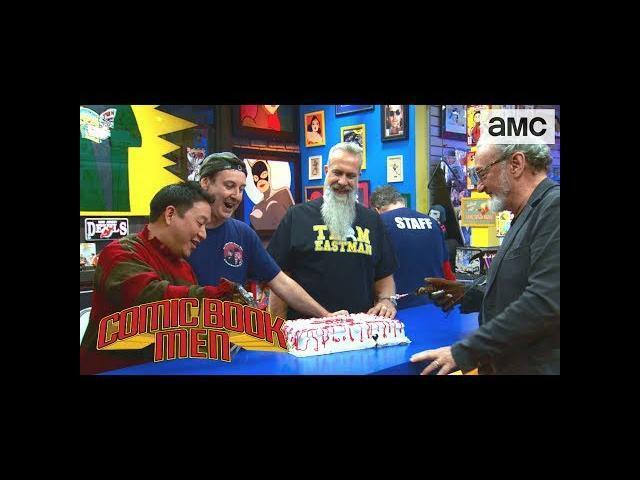 Robert Englund , better known as Freddy Krueger dropped by AMC"s Comic Book Men to wish Ming a Happy Birthday. Robert Englund gifted Ming his very own Freddy Krueger glove and also autographed it. Englund throws in his classic humor of teasing Ming if that Robert Englund autographed Freddy Krueger glove will help him get laid. This video is a little under 2 minutes long of fun and laughs. Robert Englund gives Ming a special Freddy Krueger-themed gift for his birthday!! For more Comic Book Men videos: http://goo.gl/MUN02G.